With each successive version of Apple's iPhone, the camera has improved. Although I only have the 4S model, I understand that the camera on the 5 is the best yet. Including cameras and supporting apps, I probably have 40-50 photography-related apps, with 30 of these on my iPhone right now! Our entire trip to Korea was captured using iPhones. With a computer-based program like Adobe Photoshop, there are numerous features included in one piece of software. However, apps usually have one or two functions. Below is a screen shot of the first set of apps. A brief description of each follows. PhotoSize. This simple, free app gives the dimensions of the selected photo. Flickr. 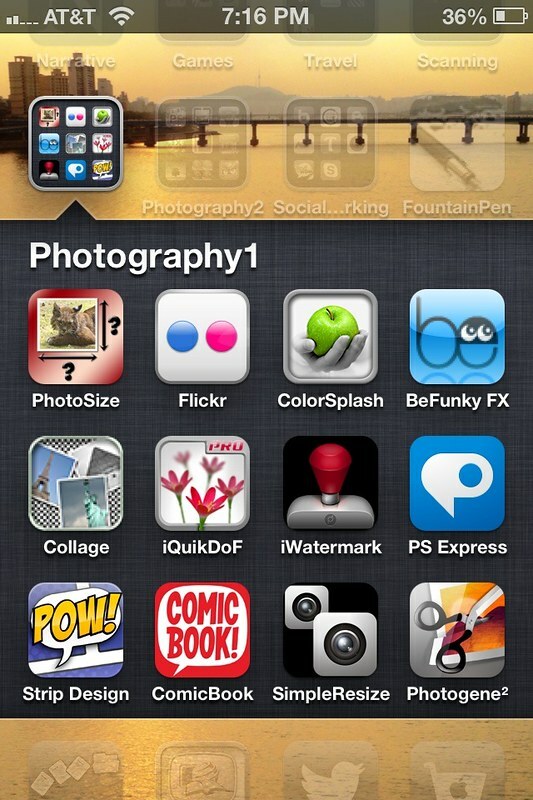 This is the official app for the Flickr photo sharing and storing site. Upload multiple, full resolution photos. ColorSpash. Convert a photo to black-and-white while keeping selected areas in color. BeFunky FX. This app allows you to create effects such as cartoonizer, inkify, and grunge. Collage. Create a collage with multiple photos. The app allows you to arrange photos and even use a photo as a background. iQuikDof. Blur out selected areas to given a tilt shift or bokeh type of appearance where parts of the photo are out of focus. iWatermark. Add a text or graphic watermark to your photos. You can now compete with Olin Mills! PS Express. This app from Adobe is a basic photo editor. Strip Design. Create your own comic strips. I use the functionality of this app to quickly put multiple photos together when I don't need to artistically arrange them as with the Collage app. ComicBook. Similar to Strip Design, you can create comics. This app features several effects that resemble actual comics such as manga, sketch, and toon. SimpleResize. If you need to take photo and repixelate it, so that a 4x6 needs to be 8x12, this app will add in the extra pixels. Though not fancy or too precise, its basic functionality is good. Photogene. This is a basic photo editor that has several effects and the ability to auto correct photos.